"The Farm", a 47-minute documentary by Mike Kavanagh, MaryEllen Churchill, and Kathy Katz, produced by Jack Wickert. The Farm's beginnings, prior to any construction of La Raza Park next door, c. 1974. City bulldozers clear area for park, but leave part of garden intact due to court order. 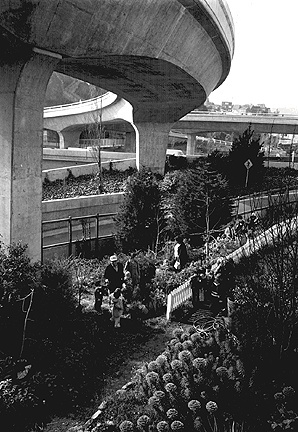 The Farm was a unique "autonomous zone" that lived under the freeway interchange of Highway 101, (then-)Army Street, and Bayshore Boulevard/Potrero Avenue. It began in 1974 and ended in a sad eviction in 1987. It was a farm with farm animals, gardens, a theater, a school, an art gallery, communal kitchen, a punk rock club, and a challenge to the prevailing values in the city. Their effort spawned a 4.5 acre park, which became today's La Raza Park. It was a place occupied by a spontaneous, grassroots, independent, autonomous collective organization that created itself. Jack Wickert and Bonnie Sherk moved on the abandoned, desolate asphalt of the former factory in 1974, intending to tear up the concrete and build a model farm to environmental education for school children. They founded the Crossroads Community and inspired a community of artists to help transform the space. Ultimately an incredible mix of people shared in some part of the Farm experience: elderly, school kids, all ages, all races, wildly diverse values and expressions. Local kids were drawn into gardening by the gardeners to stop them from carelessly wrecking the gardens. They grew Swiss chard, lettuce, cabbage, tomatoes, corn, potatoes, onions, garlic, cucumbers and numerous kinds of squash. The San Francisco Mime Troupe came to depend on it as a rehearsal space, as did a number of other performance groups. Meanwhile over 70 farm animals co-existed with special classes for K-3, kid-produced theater on the big stage, rehearsals, an art gallery, regular pageants, festivals, youth group gatherings, outdoor shows. Rhodessa Jones: "The farm was one of those early industrial, multi-purpose, multi-disciplinary, multi-cultural spaces in San Francisco." The punk era came to The Farm from 1983-86. Bands such as MDC, Tragic Mulatto, Polkacide, DOA, Descendents, and many others rattled eardrums at Farm shows. A protracted legal struggle between Farm tenants and the landlords included a Temporary Restraining Order gotten by the Farm to prevent any damage to their gardens in September, 1981, until finally all avenues of appeal were exhausted and they were evicted on November 5, 1987. The landlords claimed they would be willing to rent to anyone at "fair market value" except the current residents of The Farm. "They had to step on it because it existed and flourished outside all official channels, it was out of control . . . The same reason we loved it and it represented life to us, they had to kill it . . . because it represented disorder, misrule, anarchy. . ."
—Joan Holden, playwright, SF Mime Troupe, in The Farm, a documentary film by Kathy Katz and Mike Kavanagh, produced by Jack Wickert. 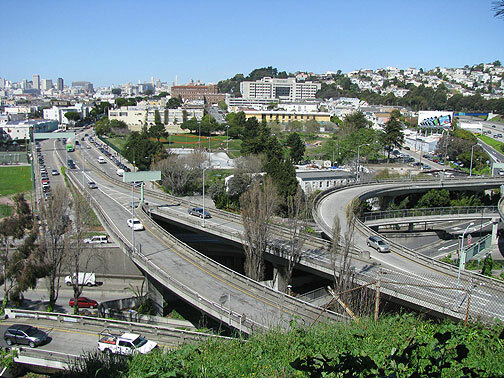 Site of The Farm and La Raza Park, as seen from Bernal Heights, 2009. 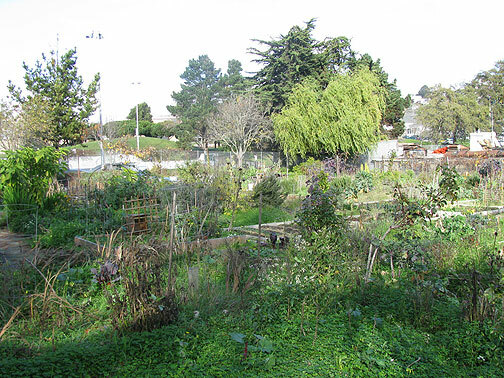 Potrero del Sol garden, still flourishing in 2009, more than two decades after the demise of The Farm.